Because of media obligations associated with the re-release of Dr. D’Adamo’s first book, there is a schedule conflict with the January 7-8 seminar date. The seminar will be rescheduled for a later date. Please check back for further news and details. Dr. D’Adamo periodically does these for those practitioners who prefer a more hands-on approach to learning Opus 23 (vs. the wonderful 5 hour webinars done by Drs. Greenfield). If you are interested in this type of hands-on training, contact Carol Agostino at carol@dadamo.com (203 761-0042) for full details. The genomic DNA analysis software Opus 23 includes the Utopia suite of apps for analyzing sequential uBiome data, comparing sequencing-based clinical microbiome data with the client’s own genomic DNA. PANSOPHIA is an Utopia app that gives you the power to sort your client’s data based upon associations with health and disease as well as several other useful categories including keystone, probiotic, core species and butyrate production. For those clients who have more than one data sample, PANSOPHIA allows you to visualize treatment progress in a graphical format that can be easily added to your client’s report. From the Utopia drop down menu, hover over ‘analytics’ until a second list appears, then select PANSOPHIA. You will then be presented with the default table which shows ‘everything’ and is sorted by ‘rank’ or ‘percent’. At the bottom of the window is a jump screen that allows you to move from one screen to the next. You can control how many rows to display be selecting an option from the ‘Show’ pull down menu. The default is 15. PANSOPHIA allows you to parse the taxon data based upon desired treatment goals. Taxa are sortable by benefit as well as pathogenic potential. There are two ways to filter the data. You can use the category tabs at the top of app’s main screen to select taxa grouped by their associations with health and disease. Once a category is selected, the information will be displayed in graph form. Click on any desired taxon to open up its information pop—up window for detailed information including taxonomy, an overview of known disease or health benefit associations, interactions and metabolomics. Click ‘add/ curate’ to include it in your clients report. Additionally, the graph itself can be printed or added to your client’s report. From the main screen, you can sort the taxa by ‘name’ or ‘client %’ then select desired taxa individually using the display box selections on the left hand side of the screen. Once you have made your selections, click the orange ‘display selections’ button at the top of the screen. The individual taxon information will be displayed in graph form. Click ‘add/curate’ to include the graph in your client’s report. Dr. Peter D’Adamo and Dr. Tara Nayak present an introduction to Utopia, the free microbiome analysis add-on module to Opus 23 for uBiome test results. To use Utopia, you will need to have your client’s 23andMe data already uploaded to Opus 23. You can then upload as many raw data files from uBiome tests as you have for that client. Utopia will work with individual uBiome tests, referencing the client’s 23andMe results where appropriate, and also give sequential analysis for multiple uBiome tests. The unique combination of Opus 23 and Utopia make this an opportunity for practitioners to get deep insight into their clients on both a genomic and a microbiological level, all sourced from published medical literature. The interaction between the two genomic analyses provides unparalleled informatics tools, and gives the practitioner an edge over any other genomic analysis tool available today. SPECTRUM provides a visual representation of the taxonomic data at both the genus and phylum levels. The app demonstrates the weight, influence and diversity of your client’s microbiome in two helpful display formats, each of which are clickable for a deeper look and easy report curation. From the Utopia drop down menu, hover over ‘analytics’ until a second list appears, then select SPECTRUM. Phyla and genus are displayed in pie chart format, which is accompanied by the spectrum profiler found below. The pie charts follow the color-coding conventions found in OPUS23 indicating beneficial, neutral as well as pathogenic organisms. Click on any desired section to open up its information pop—up window for detailed information including taxonomy, an overview of known disease or health benefit associations, descendants and metabolomics. Click ‘add/ curate’ to include it in your client’s report. The spectrum profiler demonstrates the trends in your client’s biome diversity in a graphical format. Clicking on any of the category headings will open a pop-up window listing the organisms found in your client’s sample. Each genus listed is also clickable, opening a pop-up window for detailed information, including taxonomy, an overview of known disease or health benefit associations, descendants and metabolomics. Click ‘add/ curate’ to include it in your client’s report. Metabolomics is a powerful addition to the spectrum profiler that provides a comprehensive list of metabolites associated with GI biome species. 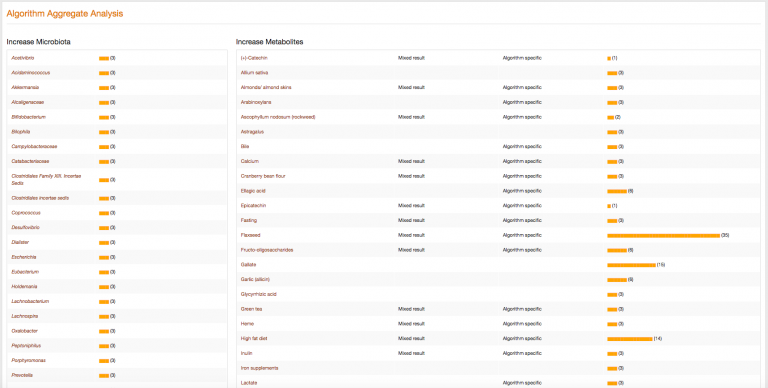 A list of all metabolites active in your client is included. 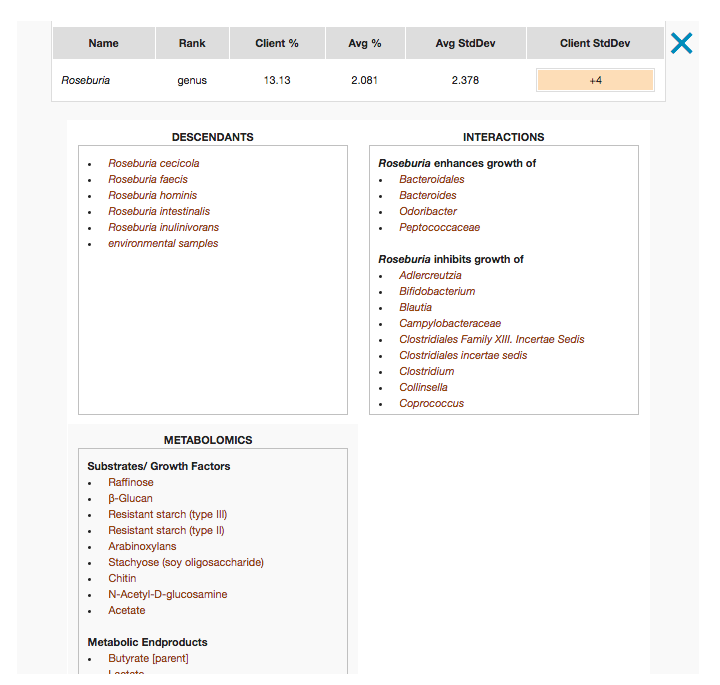 Click on an individual metabolite for detailed information, including genera that are enhanced, inhibited, and those which generate the metabolite as an end product. Click on the Metabolomics link to open a pop-up with all active and inactive genera. Announcing the launch of Utopia, the suite of apps within Opus 23 that analyzes and reports on sequential data from uBiome tests. uBiome is the world’s first sequencing-based clinical microbiome screening test, giving the user insight into the bacterial population of multiple body areas. Utopia recognizes all bacteria found by uBiome, but is specifically interested in the gut bacteria and its interaction with the client’s own genomic DNA. Utopia is free for existing clients: Once you have uploaded 23andMe raw data for your client, you can add as many uBiome tests as you want for that client without additional charge. Utopia will then give you access to multiple apps to analyze the data and reference it to the client’s genomic data where appropriate. LOAM is a highly flexible search and sort tool that allows you to easily navigate through your client’s Ubiome results by taxon. 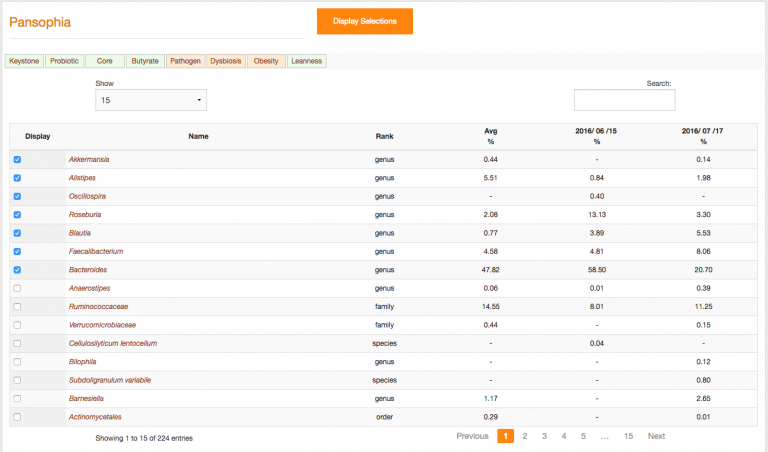 LOAM allows you to filter taxonomic data based upon several useful parameters as well as sort the filtered results. It is similar to the ARGONAUT app in Opus 23. From the Utopia drop down menu, hover over ‘analytics’ until a second list appears, then select LOAM. You will then be presented with the default table which shows ‘everything’ and is sorted by ‘repute’ or ‘interpretation’. LOAM allows you to parse the taxon data based upon desired treatment goals. Taxons are sortable by benefit as well as pathogenic potential. Repute, displaying beneficial !, neutral ! and pathogenic ! Click on any desired taxon to open up its information pop—up window for detailed information including taxonomy, an overview of known disease or health benefit associations, interactions and metabolomics. Click ‘add/ curate’ to include it in your clients report. The Curated column will then show a green checkmark against all curated taxon after refreshing the page. LOAM columns are sortable. Click on any column title to sort by that column. Click that column again to reverse the sort order.